Suitable for all dry techniques, excellent pigment bond; limited use for paintbrush drawings. Cover grey pasteboard 300 gsm. Staple bound. 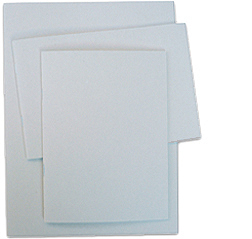 Sketchpaper with rough surface, wood-free, acid-free (pH 8-9,0), no chlorine bleach (ISO 9706 "long life", ANSI- u. O-Norm). All booklets have a label blank inside for lettering. A very cheap booklet with high quality paper. The same type of paper as in the Sketchbooks with pasteboard cover. Paper made in EU, booklets made in Germany.